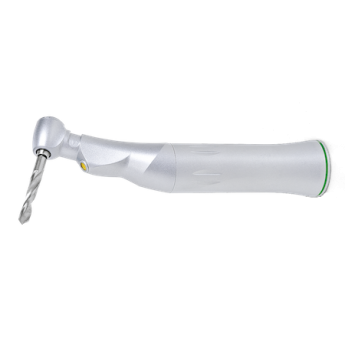 We are partnering with Nouvag to offer their 20:1 Contra Angle Handpiece at a special rate for our customers (A $1715 value!). Nouvag Contra Angles are fully autoclavable and made of medical stainless steel, is very solid and durable, and available with different transmissions, all equipped with INTRA EN3964 couplings, external cooling and optional internal cooling to prevent tissue damage. The solid construction and its well-designed details guarantee for long life and make them fully autoclavable. This 20:1 Contra Angle features LED capability for maximum visibility as well as a hexagonal clamping mechanism that allows for a maximum torque of 80 Ncm.